Edge Series snare drums incorporate a handcrafted 10-ply, all-maple center section with top and bottom bands of extra-heavy gauge brass. The Edge snare drum utilizes a 10-ply maple center section that is handcrafted for precision and held securely together with large brass bands. The brass is about 3/8" thick which provides a solid foundation. The result is a tight, attractive snare drum that delivers excellent crack with rich wood undertones. With the overall shell being about 3/8" thick, players will enjoy the focus and projection that this shell offers. For dynamic players, the shell provides a full-bodied note that will work well for live or session work, and for heavy-hitters, the shell delivers superior projection which is well-suited for high-volume gigs. This drum weighs in at 16lbs so it will not be for everyone, but if you are looking for something with a little substance, the DW Edge snare drum can provide that for you. In this video, Sound Pure percussion specialist Barry Knain explains the various features of the DW 6x14 Collector's Edge Snare Drum Natural Satin and tests it out in several different tuning ranges. 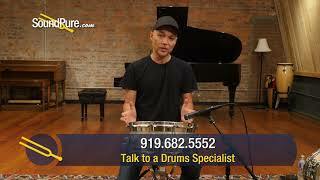 In this video, Sound Pure percussion specialist Barry Knain explains the various features of the DW 6x14 Collector's Edge Snare Drum Broken Glass and tests it out in several different tuning ranges. The patented Edge offers a sound that no other snare drum can equal. A mixture of metal alloy with either a 10-ply or solid maple center, it gives drummers plenty of versatility for a multitude of playing situations. Cork it up for R&B and Hip Hop, or tune it low for Rock or studio recordings. The Edge is the best of metal and wood in one drum. Metal Edge rings are available in chrome or gold only, but lugs and other drum hardware can be mixed and matched for a unique, personalized look. The Edge center can also be finished in any Custom Shop finish.